The parliament's Secretary General Fathamth Niusha, on Saturday, stated that any bills that remain unresolved by the end of the ongoing parliamentary term would become void. Speaking to local media outlet Mihaaru, Niusha stated that parliamentary regulations stipulated the nullification of pending bills upon conclusion of the final term. She confirmed that a considerable number of bills and amendments submitted to the parliament remain unresolved. Once declared void, Niusha stated that such bills must be resubmitted by the government or an MP. 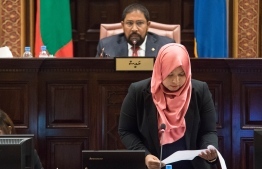 The last session of the first parliamentary term of 2019 is scheduled for April 15, with different parliament committees having placed several items on the agenda. Therefore, if all pending bills and amendments are not passed or rejected on this date, additional sessions must be held during the recess period. According to parliamentary regulations, a one-month recess will commence after the end of the first term which is conducted from February to April. The first term's conclusion also marks the end of the term for all MPs elected in 2014. The nineteenth parliament will commence its term in July after the newly elected 87 members take their oath on May 28.